Illinois State Police say a speeding truck entering stalled traffic in a construction zone caused a chain-reaction crash on Interstate 55 Monday that killed four people and injured four others. A fifth person was killed in a second crash about three miles away. Eyewitnesses told police a truck driver entered the construction zone at a high rate of speed in the northbound lanes of I-55 near Arsenal Road, in Elwood, at about 2:30 p.m. The tractor trailer slammed into a car and caused a chain reaction crash involving three vehicles and another tractor-trailer. Kimberly K. Britton, 43, and Piper Britton, 11, both from Urbana, were killed. Also killed were Vicky L. Palacios, 54, of Coal City and Ulrike P. Blopleh, 48, of Channahon. 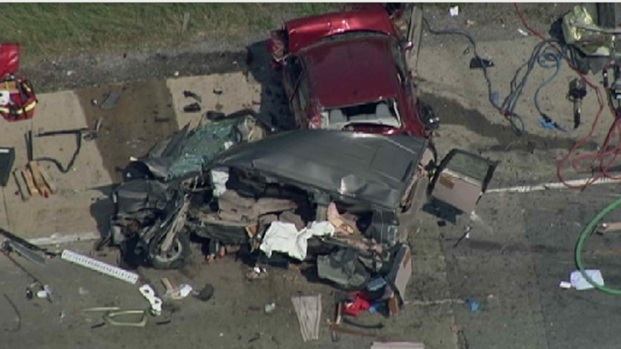 Sky 5's Mike Lorber surveys the scene of a multi-vehicle crash near Elwood. Four other people were injured in the crash, including some who needed to be extricated from their vehicles. One of the victims was airlifted to a local hospital. The truck driver, 51-year-old Francisco Espinal-Quiroz, of Leesburg, Indiana, was arrested early Tuesday and charged with falsifying a log book and willful violation of a log book. He was also cited for failing to reduce speed. Police said he underwent mandatory drug and urine testing as part of the initial investigation. I-55 northbound was closed for several hours at River Road, but reopened around 8:15 p.m.
Minutes after the crash and about three miles to the north, another accident (pictured, below) occurred in the southbound lanes of I-55 near U.S. Route 6, the first interchange a mile south of I-80. 58 accidents reported near Elwood area over the past year. NBC 5's Phil Rogers reports. 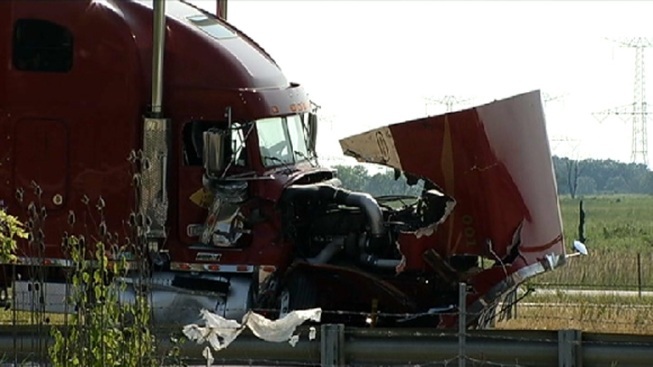 A tractor-trailer rear-ended another big rig, sending both drivers to local hospitals. One of the drivers, Deividas Mockus, 41, of Darien, was pronounced dead at St. Joseph Medical Center in Joliet. The southbound lanes were closed for several hours, but reopened at about 5 p.m.